RV vacations on the rise in both Canada and the U.S.
ABBOTSFORD, BC (February 4, 2016) – Earlybird RV Show and Sale organizers are optimistic that a trend towards Canadians staying at home for vacations will result in more people turning towards RV’s for their primary vacations plans. A recent Conference Board of Canada report showed that Canadian travel within the country increased by 2.8 per cent last year and is expected to increase again by 2.4 per cent this year – primarily due to the low loonie and lower gas prices. Lower gas prices and a low Canadian dollar support a growth trend in the RV industry. since 2006 as more of the travelling population started to recognize the benefits of RV vacations. 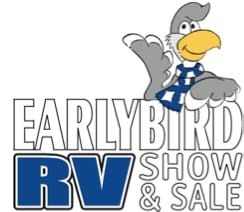 Henschell says this year’s Earlybird RV Show & Sale is the perfect opportunity for people looking to either enter the RV vacation space for the first time, or upgrade their current RV as they make vacation plans. As in years past, this year’s show will feature hundreds of the newest RV models in all price categories. Attendees will get to see the ultimate display of all RVs, destinations and products as well as hear the latest tips and travel advice on a wide range of topics from industry experts. LOCATION: TRADEX – Fraser Valley Trade & Exhibition Centre, Abbotsford – 1190 Cornell St. HOURS: Thursday, 10:00am – 9:00pm; Friday, 10:00am – 9:00pm; Saturday, 10:00am – 9:00pm; Sunday, February 21, 10:00am – 5:00pm. ADMISSION: Adults: $8; Seniors: $6(60+); Youth: $5 (13-19); Children: Free (12 & under); Family Pack: $20 (2 Adults & up to 4 Youth); Multi-Day Pass: $10 (Adults and/or Youth). Cash, debit and credit accepted.